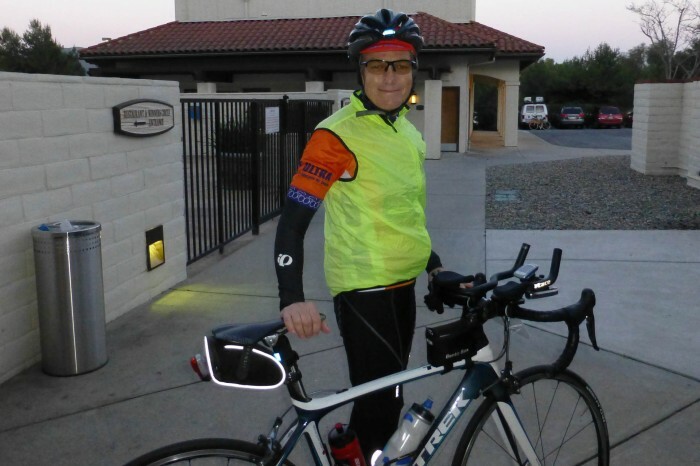 Early this year I realized that the Solvang Double Century would be a great way to celebrate turning 65 by biking 3 times my age in miles. With our traveling to Japan in February, I only had 4 weeks of training going in, so I knew I was not going to be as fast as prior times. 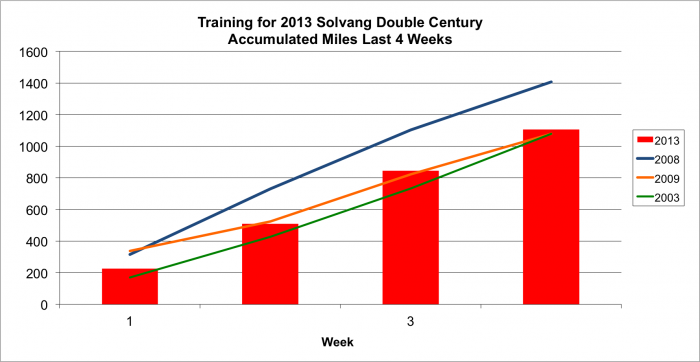 It turned out to be another cold start for the Solvang Double. It was 39 degrees so it was hard to know how to dress for it because you don’t want to carry too many clothes as the day warms up. I settled on a base-layer, vest, knee warmers, double arm warmers and a skull cap. I lined up at the start area just before 7 am, looking to get with a group. No group seemed to be forming so I decided to go with a tandem with two male riders. That might not have been such a good idea because they were stronger than I expected, even on the short climb up to Solvang. Nevertheless I was able to stay connected. 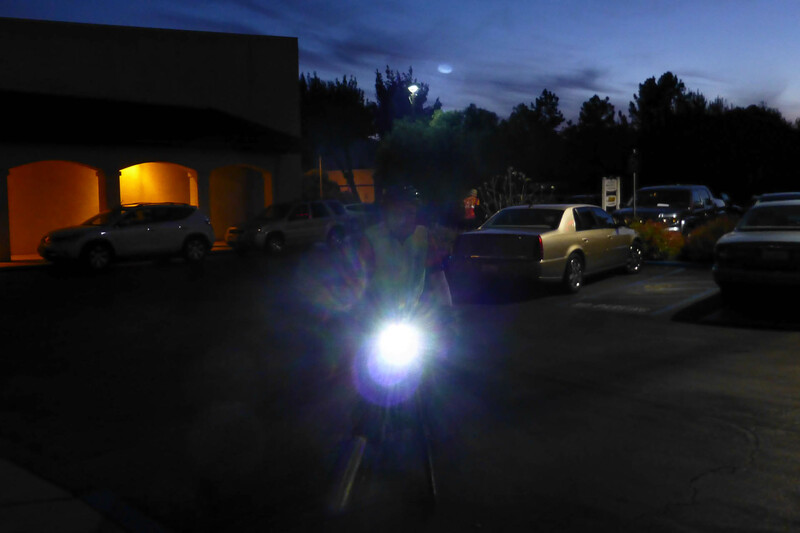 We passed several other riders who had started early, picking up two other riders, David and Marc. The three of us drafted behind the tandem, and I even went out to take a short pull. About 15 miles into the ride, there was a short downhill with a sharp turn that the tandem ripped through much faster than we could and a gap formed. We wasted too much energy trying to close the gap and finally we mutually decided to give up the chase and the three of us rode together much of the rest of the course. 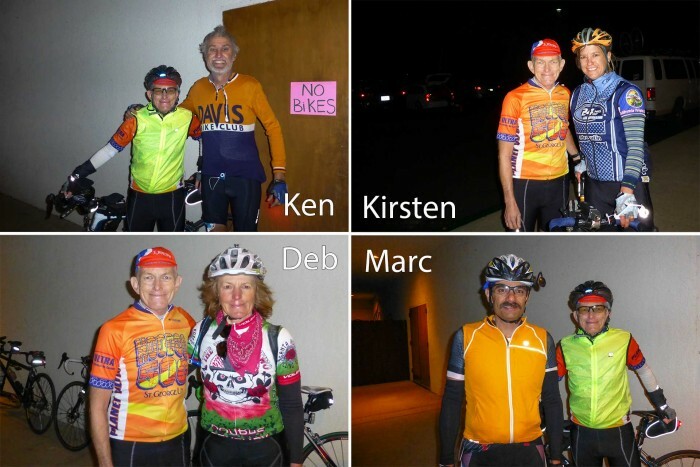 I knew my training for Solvang was not as complete as prior years and there was no way I could keep up with the fastest riders, which is why I started at 7 am instead of 7:30 am with the fastest group. Still I was feeling in pretty good shape and would go ahead of Mark and David on the climbs up Foxon Canyon and they then would pass me on the descent side. When we were approaching the first rest stop at mile 41, I passed Art Cruz, which was a surprise because I thought he started 2 hours earlier than me. I usually skipped the first rest stop but David wanted to get water so I thought it would be good to stop. The temperature had dropped as low as 34 degrees so I was not drinking that much, but on the other hand I was glad I had now worn a jacket because I was feeling fine and even took off the glove liners at the first stop. 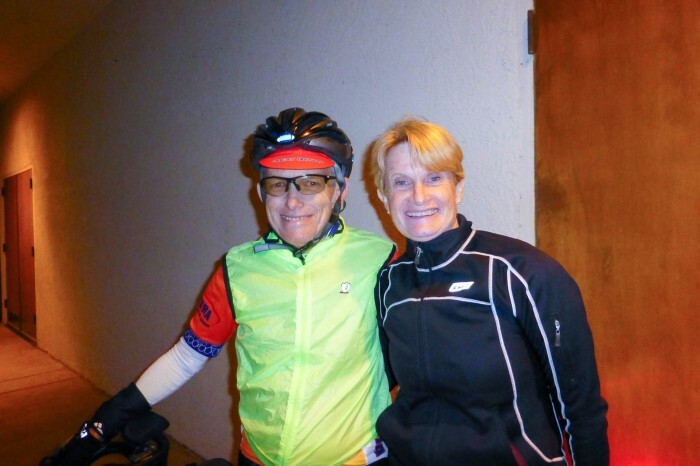 At that rest stop, Art Cruz arrived before we left and he told me he started at 5 am, but had missed a turn and had already ridden an extra 22 miles. What a bummer. While we were at the rest stop the 7:30 fast group came zipping by. 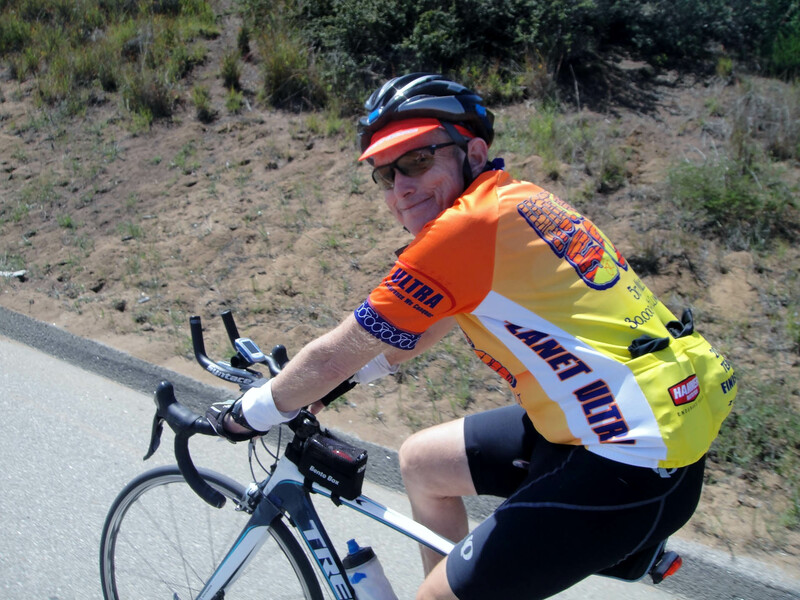 I had thought at one time of jumping on their wheel after Foxon Canyon when it was more flat and easier for me to stay connected but in hind sight that would not have been a good idea. Once we started riding another group came by with a couple of tandems and I told my new riding partners, lets get on the train. The headwinds were getting rather strong. With no wind I would probably have been okay to stay with the paceline but the strong winds raised havoc because I could not get the full benefit of drafting. I started to get worried about burning out so I told David and Marc I was dropping off, and they did also. I was glad they dropped back because I drafted behind them as we kept moving through the head and cross winds. Even with their help the winds were so brutal to me while they did not seem to affect the bigger guys as much. Around mile 75 I was wondering if I would ever be able to finish this ride. Knowing the rest stop was around mile 80, I just kept plugging away, often dropping off for awhile, then working my way back up. The rest stop was not until mile 85 and I needed some time there to recover. I knew that this was not going to be a sub 12 hour ride like in the past and I would need to take more time at the rest stops. I was glad when we reached the northern part of the ride around mile 100 when the winds would be either a cross wind or tail wind. By now my legs were feeling over stressed and I was afraid I was going to cramp. I was taking a lot of electrolytes and drinking a lot but you can also cramp from fatigue. Somehow I made it to the lunch stop at mile 113. I saw Deb Hoag there, and she was getting ready to leave when we arrived. I ask Marc and David to not slow down again for me and if I dropped off the back to just go ahead and that I had decided to ride a slower pace. I took advantage of the stop to plug my Garmin Edge 810 into the external battery supply so it would start to recharge since I knew it would not last the entire ride. After eating a subway sandwich I started off with David and Marc but within 5 miles I made the decision to drop the pace a bit and make sure I did not cramp. Soon it started to cool off from the high 70’s it had been at the lunch stop, because we were near the coast. That would be a good thing since I usually don’t cramp when it is cooler. At the next rest stop, mile 141, I arrived before David and Marc left but told them I was going to ride solo. I was there for some time, again recovering. I decided to swap the external charger to my iPhone but then I realized the LiveTrack feature of the Garmin 810 was not working. I saw a text from Anne that LiveTrack was not working since the beginning and she had been worried. I sent her a text to let her know where I was and tried to get LiveTrack to work again. The combination of the cooler weather and more resting worked, and I was feeling much faster after that and even thought I was riding by myself, I was moving along very quickly. I arrived at the last rest stop once again to find Marc and David. I told them I would ride with them again since I was no longer on the verge of cramping. Marc was now the one who had the issue and was dropping back. David wanted to move on because he wanted to finish before 7:30, so I said I would wait for Mark. That gave me a chance to work on the LiveTrack from the Garmin to my iPhone and get it working fully. 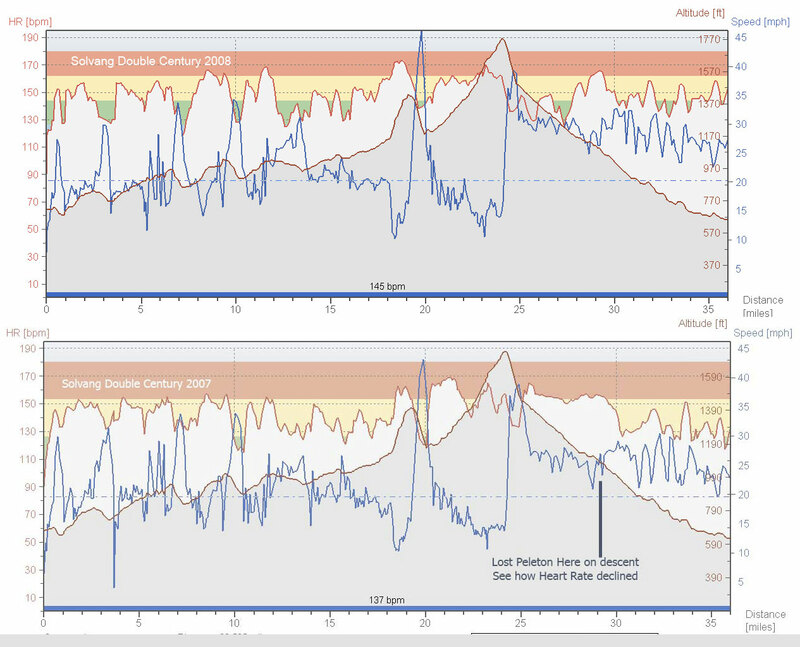 Marc had a bit of a hard time on the hills but would catch me on the descents, then he seemed to get his second wind. He wanted to finish before 8 pm and I promised him that I would ride with him to get him to the finish well before 8 pm. About 15 miles from the end we passed Lonni, who had started at 5 am. She said she was having a tough last 30 miles, but since I had promised Marc to help him finish early, we plowed on. A few other riders had latched on to us. It was just getting dark as we were going down through Foxon Canyon. I was glad I had some light, the period between sunset and civil twilight, as we were descending because I had only taken a smaller light. We finally made it down to the highway and I knew that it would be a short couple of miles to finish. We finished at 7:38 pm. I probably looked a bit ragged but I was feeling fine, much better than I was at mile 75. It was great to finish. It was the first time that it took me over 12 hours on this particular double century, but in 2011 they changed the course so it was 5 miles longer and another 2,000 feet of climbing. 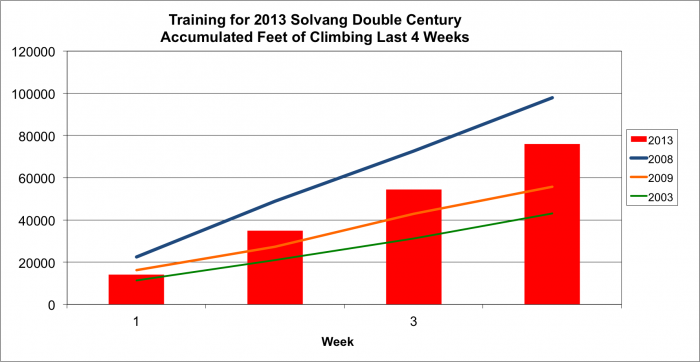 My biking time was only 50 minutes longer than the Solvang Double in 2009. That was rather good since I was clearly not in the same condition and we had those strong winds, plus the extra 5 miles and 2,000 feet of climbing. My stopping time was quite a bit longer, but I was not trying to win any race and that stopping time helped me from cramping like I did on the Knoxville Double last fall. This is how it looks compared with the other double centuries I have done. The training is over so whatever condition I am now in, is what will have to do for the Solvang Double. This time I skipped the Metcalf Mauler ride on Thursday because that is fast paced and last time before the Knoxville Double I was only going to ride it easy, but got caught up in the chase. We got ready and drove down to Solvang, leaving around 10 am. That allowed us plenty of time to check into the hotel and go on a nice ride. 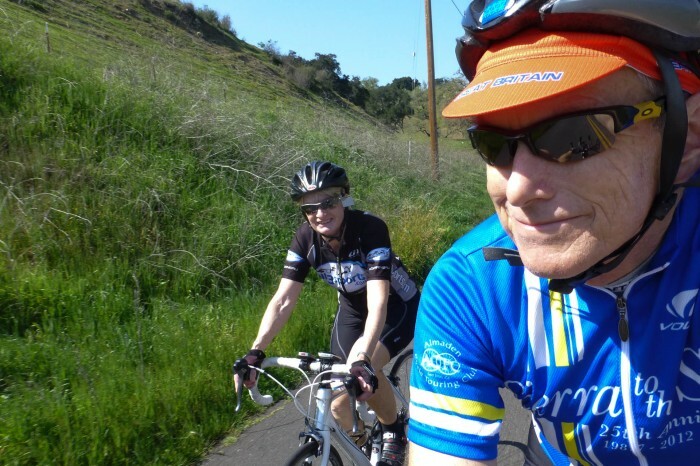 We biked through Solvang and then did the out and back that we have ridden in the past. On the way back through Solvang we were scouting out a place for a group dinner we had setup for tonight with 6 other folks. We decided on eating at the Bit ‘o Denmark and made a reservation. Before heading back to the hotel we went a few miles up the road where I will be ending the double tomorrow. It was a nice route and one we will want to bike further along next time. After getting back to the room we had plenty of time to get ready and head down to check in at 6 pm for the double century. 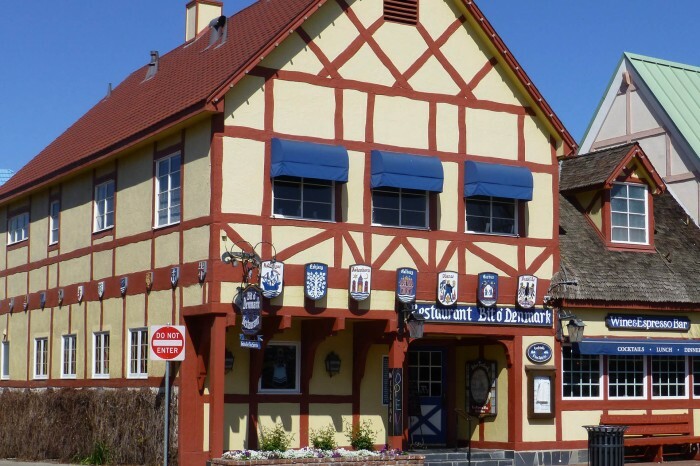 We saw David and Deb Hoag, Art and Sue Cruz and Lonni Goldmen there and gave them the details for dinner. It was a great place to eat. Tomorrow, the day of the Double Century, will be a bit cooler but should still be nice. It is going to be cold at the start, however. I am thinking to start around 7 am. 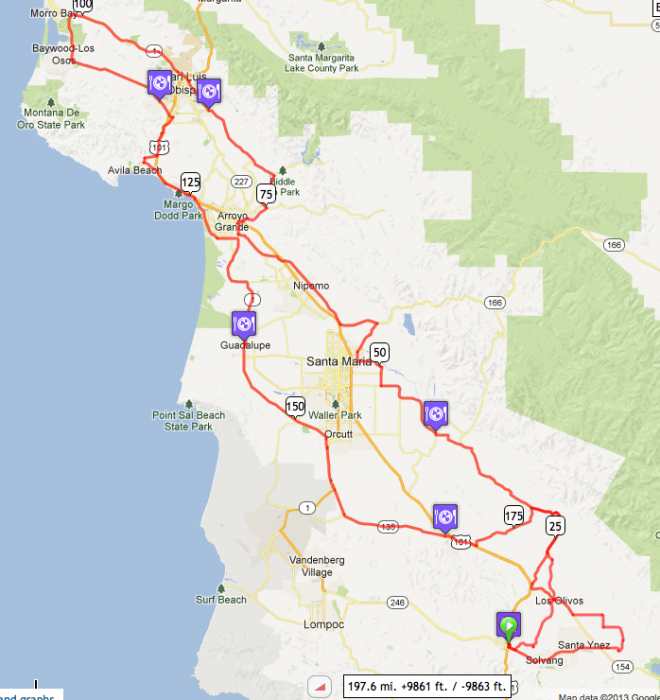 Here is the route for tomorrow’s double century. 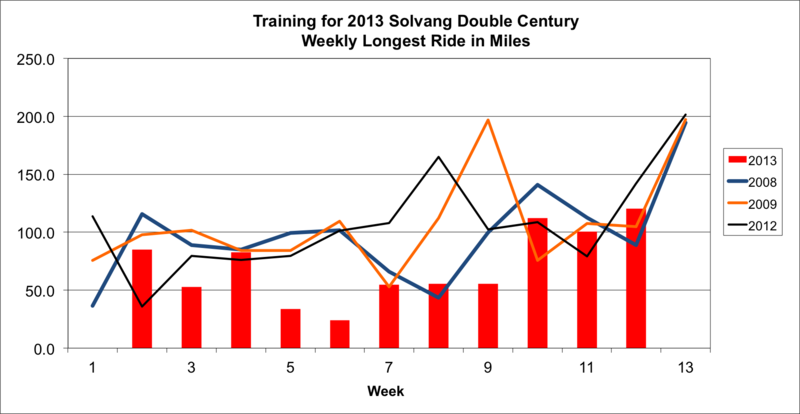 It had been five years since I rode the Solvang Double. I had signed up two years ago but had to cancel when I had a running injury while trying to train for the Salt Lake City Marathon at the same time and decided to just focus on the marathon. 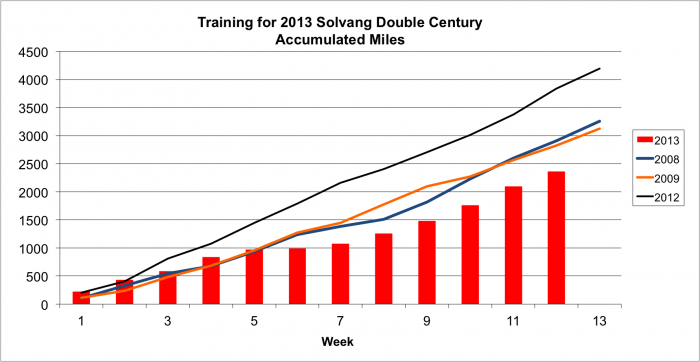 This year I had the same dual training, with the Boston Marathon just two weeks after the Solvang Double but I was better able to manage the training. It was cold in the morning, I mean in the 30’s type cold. The day turned quite nice, although it was windy and cool, especially on the coast. I sometimes thought the wind was always a headwind but overall nice biking weather and a lot more enjoyable than last year according to reports from those that rode in the rain in 2006. Joe F., Gary F. and myself (I called us the three “F”s) were under pressure to break 11 hours since I had earlier sent out an email to the long distance riders in the bike club asking them to join us to break 11 hours, so everyone there I knew would be asking us how we did. We knew some people were going to start as early as 5:00 am, which meant nearly two hours in the dark and cold but we decided to start the day off with a nice breakfast at Paula’s Pancake House, which opened at 6:00. During breakfast we decided to change our start time from the planned 7:00 am to 7:30 to reduce the time riding in the cold. However we realized that the 7:30 group would have their times recorded and posted so that put more pressure us, leaving no wiggle room when asked if we finished under 11 hours. When we showed up at 7:20 am for a role call, I was surprised by the large group, which turns out to have been 42 riders. Just after 7:30 we all took off, in one of the largest pace lines I had ever ridden it, probably like riding with a big Pro tour. The speed was about 22-23 mph. Starting at 7:30 proved challenging because if you don’t hang on the fast train all the way there is not another real fast one coming from behind. All three of us stayed with the group until about mile 22 when I could not keep connected during a fast decent. Gary whizzed by and caught on but I found myself riding alone and the train slowly pulling away. Joe soon joined me from the rear, as did one other rider, and we tried to catch them but finally gave up. There were a few other smaller groups we rode with for awhile. I remember one group of 5 riders who didn’t allow Joe or I to take a pull, as if they didn need our help. Another group, with two tandems, were mostly from Cedar City Utah. I showed them I was wearing my Utah Velo jersey so they were kind enough to let us join (I am sure they would have anyway). After some recovery time, we knew had to go ahead or would risk missing our goal. I think Joe and I rode just two of us for about half of the miles, until we were able to catch Paul D. from the bike club who had left a little earlier. Joe was glad because he had done more than his fair share of pulling by then. But then the pace picked up and I was off the back a lot on the flat part. At the second from the last rest stop Joe and I were trying to calculate if we could still break 11 hours. We didn’t want to suffer the embarrassment if we failed after all we had done. I said I thought we could not make it because we would have to ride 20 mph for the last 50 miles and skip the last rest stop. Joe didn’t give up so neither could I. I think the lack of oxygen to the brain caused me to make some error in my calculation and was about to give up and slow down, but I kept chasing Joe and Paul. 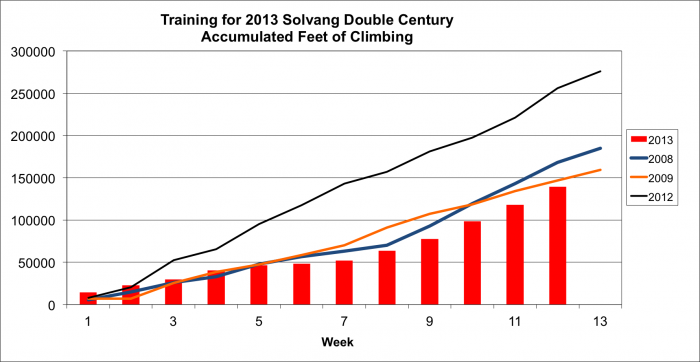 I just was hoping for some hill to climb, which did not happen until after the last rest stop. At that point I was able to move a bit ahead of Joe and found one young buck to ride with. He was from that group that didn’t want us to take a pull earlier and I remember passing him on the hill. He said he as AHEAD of the rest of the guys in his riding group so I had now passed them all. The two of us took turns pulling the last 10 miles. He complained about the pace but I told him I was a man on a mission. We went past Ken E. with about 5 miles to go who … was riding his single speed. Gee how could someone do that, even starting when he did. It was fun for me because I was able to do my fastest double so far. I came in at 10:42 total time, beat my goal, with an average speed of 19.6 mph. This photo was taken out on the course. 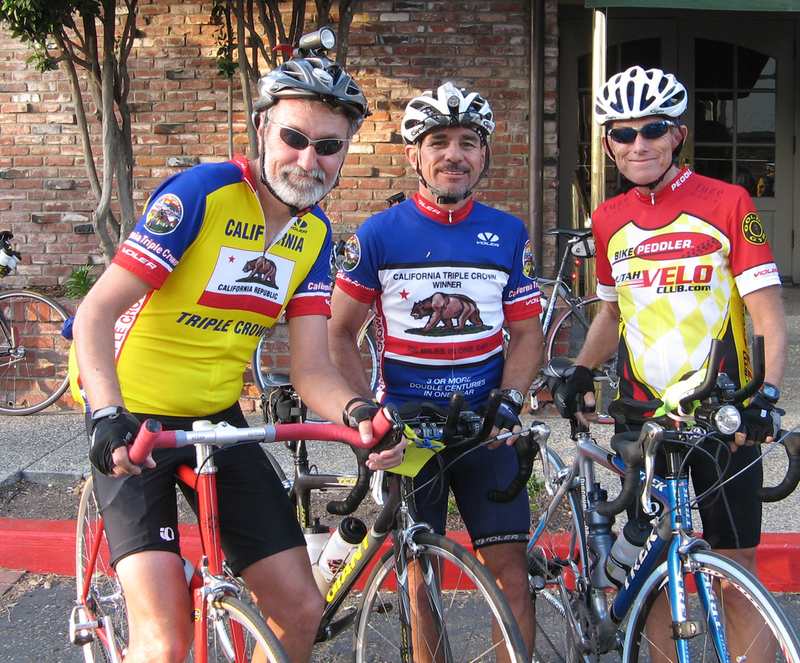 Here is a photo taken after the ride, Ken on the left, Joe in the middle and me on the right (the only one not wearing a triple crown jersey). Gary had already gone back to the room, finishing a hour before the rest of us, and Paul had left before Ann brought the camera. Here is the elevation profile of the ride. It was relatively flat for a double century.